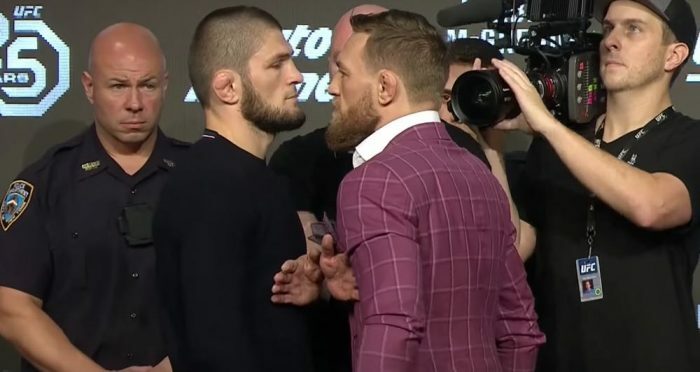 UFC lightweight champion Khabib Nurmagomedov and Conor McGregor were finally penalized for their roles in the post fight brawl that broke out after their bout ended at UFC 229. The altercation occurred just seconds after Nurmagomedov finished the fight with a fourth round rear naked choke and then leapt over the cage to after Dillon Danis, who was in McGregor’s corner that night. McGregor then ended up in an incident of his own after he jumped on top of the cage with several of Nurmagomedov’s teammates then going after him during the melee. On Tuesday, the Nevada Athletic Commission voted unanimous to suspended Nurmagomedov for nine months and fine him $500,000 for his role in initiating the brawl. The commission had already withheld $1 million of his fight purse so his $500,000 fine will come from that money and the rest will be returned to Nurmagomedov. The reigning UFC lightweight champion could have his sentence reduced by three months if he completes an approved anti-bullying public service announcement for the state of Nevada. If Nurmagomedov completes that additional step, he will be eligible to return after April 6. As for McGregor, he was ultimately suspended six months for his role in the brawl, which means he’ll be able to book his next fight after April 6. McGregor was also fined $50,000 for his part in the brawl. Meanwhile, two of Nurmagomedov’s teammates were also sanctioned at the hearing on Tuesday after they participated in the melee inside the cage with McGregor. UFC athlete Zubaira Tukhugov was suspended for one year and fined $25,000 for his part in the brawl. Abubakar Nurmagomedov was also suspended for one year and fined $25,000 for his role in the brawl as well. Both fighters will be eligible to return to action after Oct. 6. As for Dillon Danis, he remains on temporary suspension with the commission expected to rule on his punishment for the brawl in February’s monthly meeting in Las Vegas.